Small bathrooms are perhaps the most challenging decorating projects to tackle. We often have to work around the original fittings or piping and some of us don't have the means to make permanent changes. But working with such a small space means that a few clever changes can have an incredibly powerful effect on the bathroom decor! So whether you want you bathroom to appear bigger, sleeker or just that bit more luxurious, we have lots of ideas to get you started. As usual, we have tried to include examples that will work for different budgets and styles. Come with us to explore 10 simple ideas for small bathrooms! 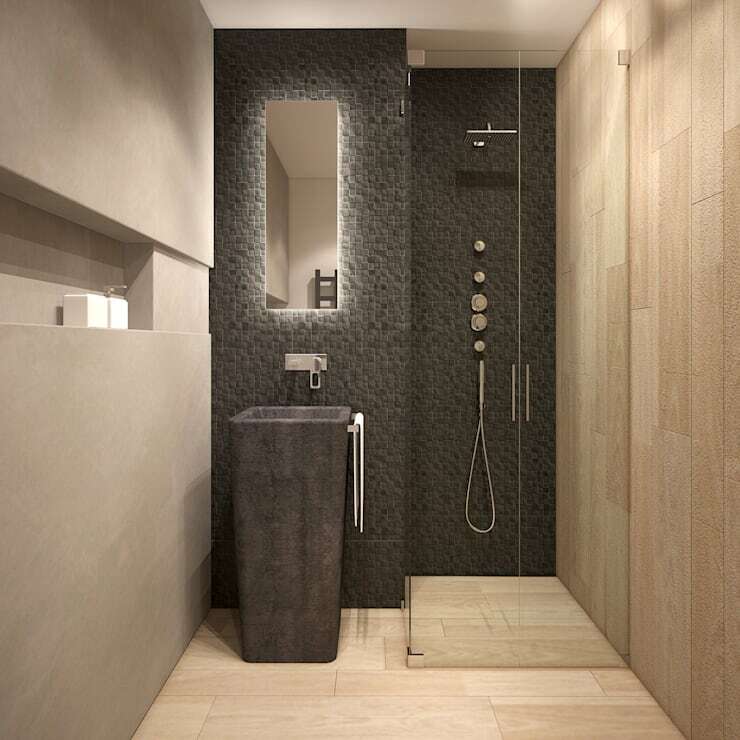 When you're working with a small bathroom, the last thing you want to worry about are visual barriers and internal walls. Consider the difference between a more traditional heavily tiled up bathroom and something like this. The bathroom has a barrier-free aesthetic. The shower screen is transparent and the raw concrete walls, seamless built in storage and fittings give the bathroom a raw, industrial quality. Everything in your small bathroom should pull its weight in decorating terms. Just look at these wooden open shelves. They have warm inset lights that give the bathroom a spa-like finish. A key element in any good design is focus. 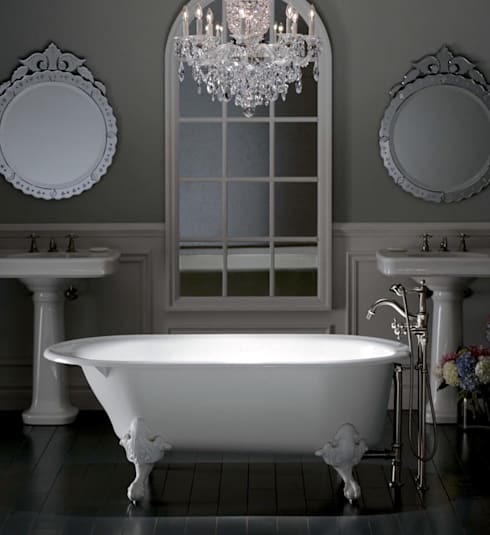 So focus the design on a key feature like a bathtub or a lovely wall. Accent lights, colour and houseplants are a few good items in your arsenal. A small room can feel crowded very easily. So it's best to keep the design it simple and sleek. Minimalist furnishings often create unbroken lines of sight that allow the eye to continue moving around the space uninterrupted. 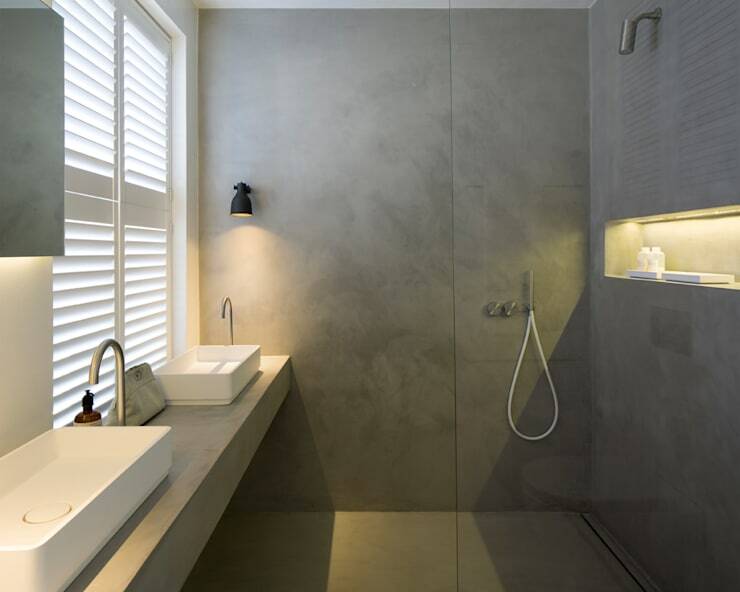 This simple grey bathroom is a good example of how this can be done well. The fittings are a big part of the decor, so they can be used to make a design statement. 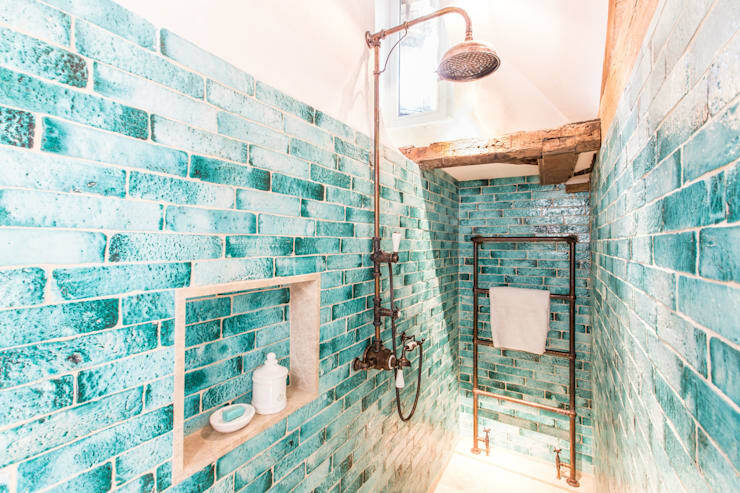 The copper shower-head and towel rack in this bathroom really stand out because they complement the green tiling so beautifully. 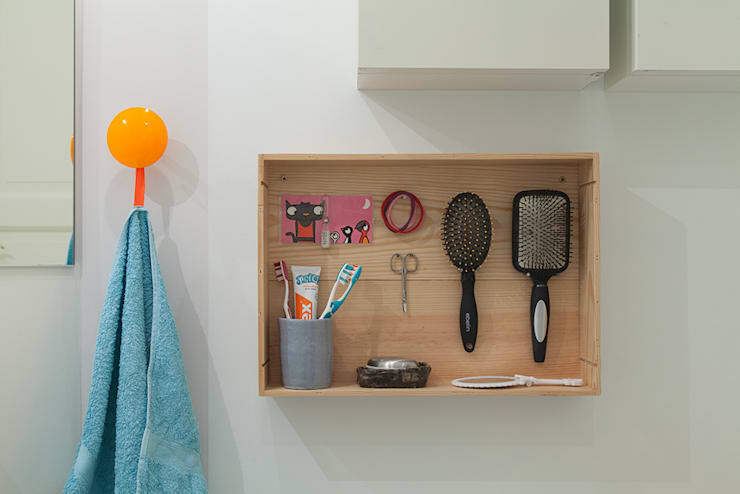 It's all too easy to default to standard bathroom fittings, but the bathroom walls are a fabulous place to explore more adventurous storage options. Perhaps a storage box like this might work. In many bathrooms, the upper wall space is often left unused. While these areas may be impractical for storage, they can be used in a decorative sense. Consider the expansive feel of this natural bathroom by Hyla Architects. 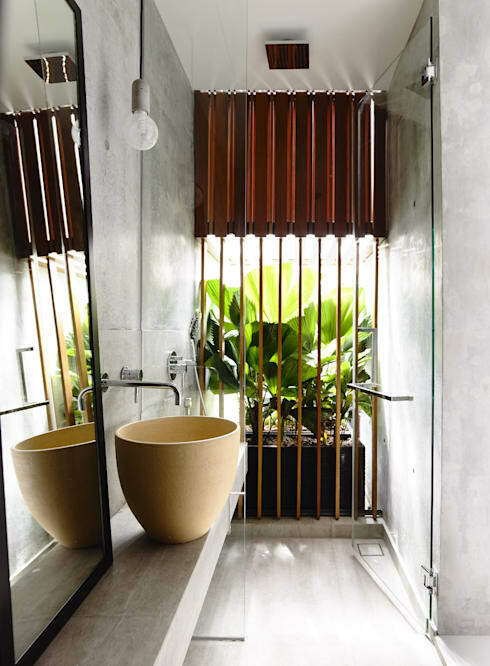 The tall bathroom mirror and wooden window direct our attention towards the upper part of the room. This adds a sense of abundance and spaciousness to the bathroom. 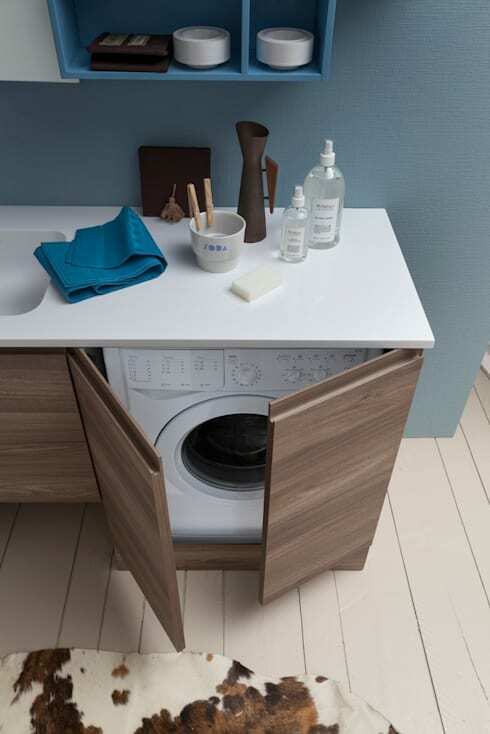 Many small bathrooms also play host to the washing machine. 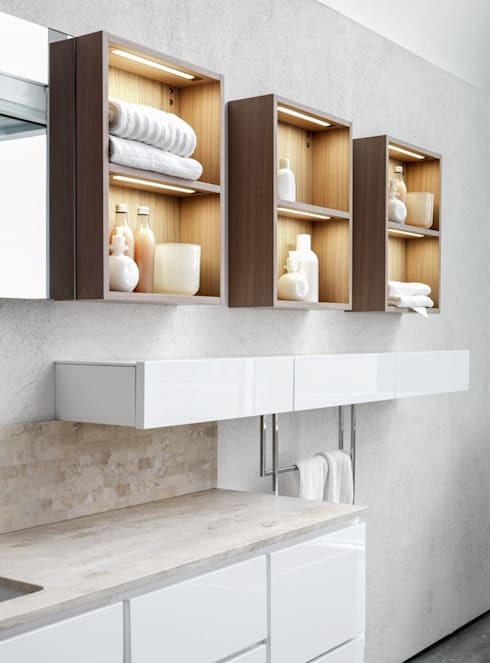 A built in cabinet like this is great because it gives the bathroom a more seamless, cohesive look. It also turns the top of the washing machine into extra bench space. 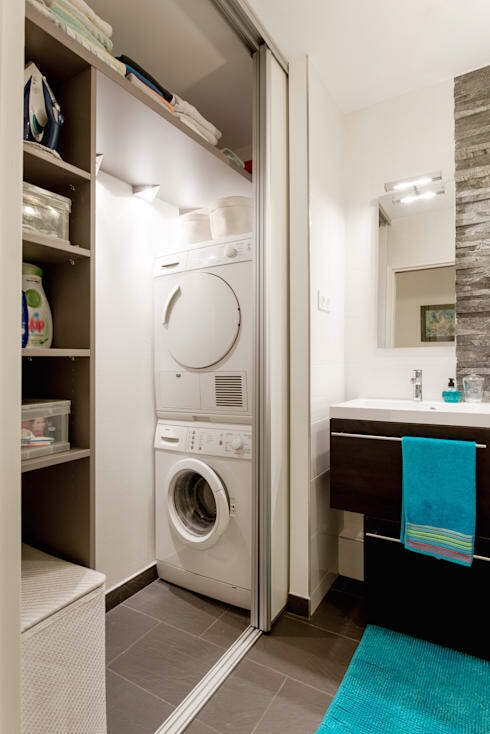 Small bathrooms are often windowless or lacking in light. A good wall mirror can combat these problems in multiple ways. If you have a window or glass door, the mirror could be placed on the opposite wall to reflect light. A good mirror could also be placed to reflect artificial lights and create the illusion of more light. But our favourite solution is to install a large mirror set inside a window frame like this. If you are lacking storage space, the area above and around the bathroom doorway might be turned into a storage area. Just check out this great little bathroom for inspiration. Some of the most underused spaces on our homes are corners. Here are a few ideas to get that sorted! 9 creative ways to decorate corners in your home. Which of the small bathroom ideas here is your favourite? Let us know in the comments field below!